Moses Lake stands out as the "boomtown" of Grant County. A period of exponential growth began in the 1940s as the result of water and air power. Moses Lake sits at the heart of the Columbia Basin Project, a monumental irrigation system controlled by Grand Coulee Dam supplying water to over half a million acres. Activation of the Moses Lake Army Air Base (later Larson Air Force Base) during World War II added to the population boom of more than 3,600 percent by 1960. Originally barriers to the success of early agriculture, warm summer temperatures and low annual rainfall make Moses Lake an attractive recreational destination for water sports, fishing, and hunting. From the pioneering days of gasoline-powered pump irrigation to the phenomenal success of modern irrigated farms, water has played the pivotal role in Moses Lake's Cinderella story of agricultural empire in an otherwise arid desert. The Moses Lake Museum & Art Center was founded as the Adam East Museum in 1958. The images in this volume were selected from the museum's repository and from local residents who generously shared their personal collections. 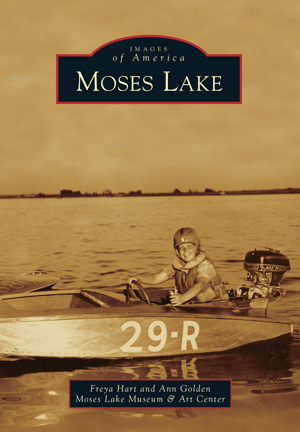 Coauthors Freya Hart, museum manager, and Ann Golden, curator, are both Moses Lake transplants.